Timetables for 2019 are now available. 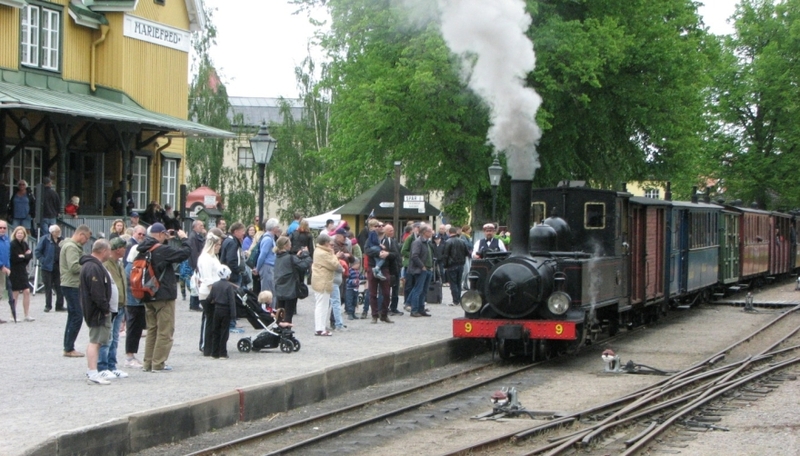 At ÖSlJ, you can take an historical journey with authentic steam trains which are approximately 100 years of age. The ride will take you between Mariefred (Gripsholm Castle), via Läggesta, to Taxinge. You can visit us easily by both car or by train; we are connected to the state railway (SJ) in Läggesta. Our blog is mostly in swedish, but posts usually include summaries in english. You may choose to spend a whole day on the railway, or combine it with sightseeing in the nearby area. We offer two popular roundtrips, “Slott & Ånga” (The short roundtrip) between Mariefred and Taxinge. Our other roundtrip is the “Mariefredsrundturen”, between Stockholm and Mariefred. At our station in Mariefred, there is a Café, a shop, and a historic railway showcase. You can find timetables, prices, and other information under the menus. Our rolling stock; including some of our engines, have once upon a time collectively served at seven railways with 600 mm gauge that had regular passenger traffic. These have been carefully restored by hardworking volunteers of the railway society Östra Södermanlands Järnväg. Map overlooking Östra Södermanlands Järnväg ♦ Click on the map to enlarge! The steamboat Mariefreds route between Mariefred and Taxinge is marked on the map.